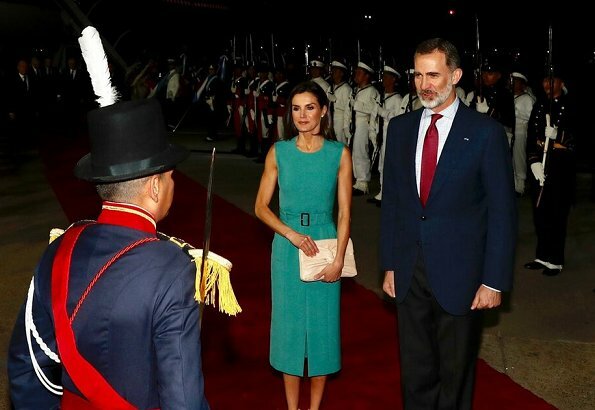 Spanish King Felipe and Queen Letizia are currently making a 3 day State visit to Argentina. 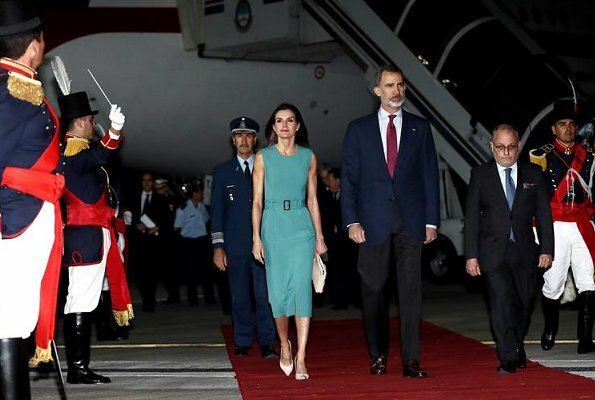 On March 24, 2019, The King and Queen of Spain arrived in Buenos Aires. The official program will begin with a welcoming ceremony to be held at Casa Rosada Presidential Palace on the morning of March 25. 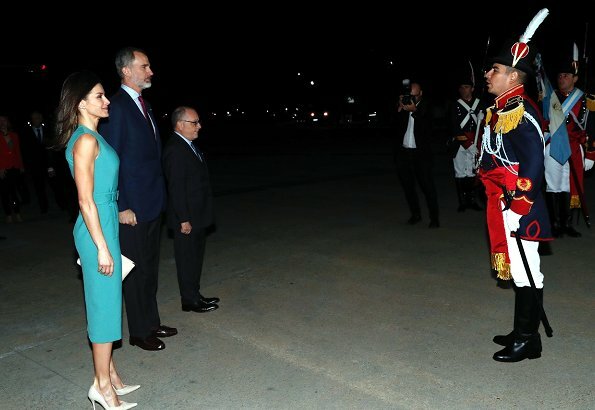 Spanish King Felipe and Queen Letizia will be welcomed by Argentina's President Mauricio Macri and his wife Juliana Awada. The King and Queen will go to Cordoba city on March 27 and there, they will attend the opening of the 8th International Congress of Spanish Language (CILE). I like Letizia's dress very much. This silhouette is always very flattering on her, and this is a nice spring color. I can only assume it was dark in the plane when Felipe put his jacket on. I guess that is what I get for wishing we would see him in something a little different. Not a good combination, blue jacket and black pants! I have seen that combination already, I do not like though. It´s actually autumn in Argentina. But nice colour anyway. That colour looks amazing on her. Beautiful as usual it is a lovely colour on Queen Letizia and I also love the shoe colour as well!! Very nice dress, very elegant and with a great spring color. Love the shoes and all complements. Agree. Not a colour we have seen her wearing recently, I think but really suit her. I like the look in everything ,she really looks beautiful. The king is so handsome and they look perfect together. Hhm. The dress is a bit long on her, but I agree that she looks good. However, I cannot help but think that this is the wrong dress for the occasion. More suited for a party night in Ibiza, and less for a state visit welcome ceremony with military honors. Ibiza?? Just the contrary, too much dressed for Ibiza, where people sometimes do not wear even clothes or only white shapeless dresses and shorter indeed!! Not military honors at all, 1 am and shut in the plane because there was not a proper ladder, also bitten by the mosquitoes.Nobody was there. 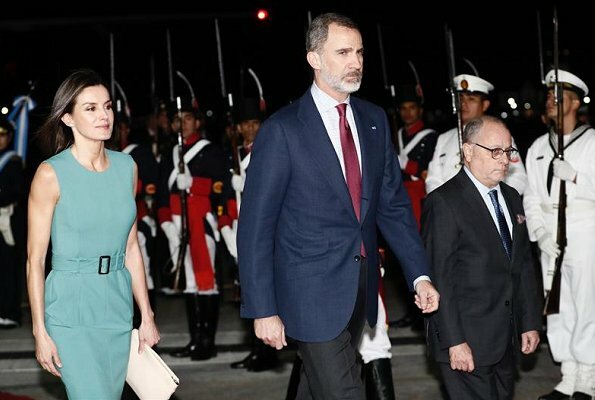 The diplomacy in Spain is a bit...upset..
Letizia looks absolutely stunning. I'm so glad its Spring because I feel like my favorite royal ladies like Catherine, Letizia, and Mary have their best outfits when its warmer even though they have great outfits all seasons. It´s not spring in Argentina, it is autumn now, and her dress looks to "summer-y" IMAO...she likes to show her arms, that´s for sure. Autumn in Buenos Aires is warm. Argentina is very large. Y hace bien en lucirlos porque son magníficos. No exageremos con el otoño. Sólo empezó hace 3 días. 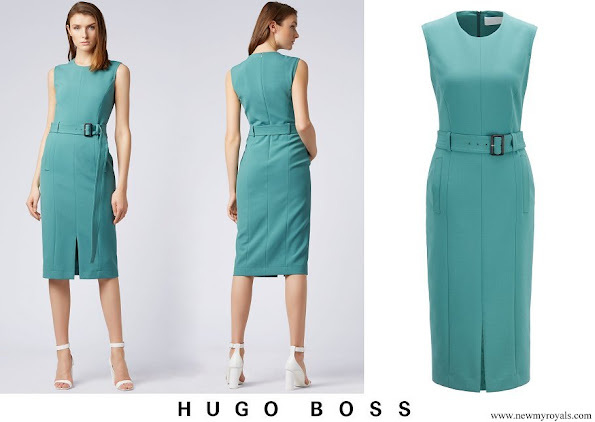 Very lovely dress and color.Hugo Boss is her go to Designer, with him she always is spot on. Poor Letizia and Felipe were locked into the plane for more than hour at 2 am, they knew that at that time the President was not to be there.At the airport they were not able to find the ladder for the door. Also lots of mosquitoes, in other photos you can see the bites on Letizia's legs. Letizia utiliza poco el color verde, pero le sienta muy bien. Este verde turquesa es precioso. Fiel a sí misma, sencilla, sobria y absolutamente chic. Perfecta.